Jackie The Musical. Pamela Raith Photography. Flares, tank tops, and Donny Osmond caps – and that was just the audience in the foyer – can mean only one thing. Jackie The Musical has landed. The Wycombe Swan was filled with ladies of a certain age last night (Tuesday) as we returned to our youth and listened to the songs that we grew up to. The power of music really is quite startling, and I literally tingled inside as the first strains of David Cassidy’s Could It Be Forever played in the auditorium. And that was really the whole point of a show created around a teenage magazine from the Seventies that featured posters each week of the idols of the time, Cassidy, David Essex, Marc Bolan and Donny Osmond, as well as doling out advice on boys and relationships from the resident agony aunts Cathy and Claire. This is a show full of nostalgia, not just the music, but the thoughts and features from the magazine, the morality of a different time, the weird and wonderful fashion (those high waisted jeans with buttons down the front, velvet trousers, hot pants and the crocheted long waistcoats!). And the music is a massive part of the evening with so many fabulous songs: Crazy Horses, I Love To Love, Tiger Feet, Hold Me Close, Love Is In The Air, Could It Be Forever, It’s In His Kiss. The central story focuses on 54-year-old Jackie (played by Janet Dibley), separated from husband John (Graham Bickley) and living with her wanna-be pop star 19-year-old son David (Michael Hamway). Jackie is unpacking her belongings and finds her old stack of Jackie magazines. She also finds her former teenage self, (Daisy Steere) who constantly gives her Seventies advice on how to deal with ex John and new man on the scene, Max (Nicholas Bailey). Also in the mix is a look inside the relationship of John and his new squeeze, the irritating Gemma (Tricia Adele-Turner), who, much to the chagrin of Jackie, isn’t yet 40. This affair isn’t all roses, as Gemma reminds John when she serenades him with I Beg Your Pardon. And then there is dishy son David, (with hair not unlike Seventies twinkly eyed and curly haired heartthrob David Essex) who is tortured by unrequited love and trying to write songs. This similarity to Essex, and indeed to curly haired Marc Bolan, comes in very useful as he sings several songs throughout the show, building to a fabulous scene where he practically ravishes the woman of his dreams as he gyrates about the stage performing T Rex’s 20th Century Boy, much to the delight of the mature ladies in the audience. There were clearly a lot of Donny Osmond fans in the theatre because when barman Frankie (Matthew Barrow) sang Puppy Love with a chorus of girls fanning him with massive ostrich feathers, he brought the house down. The scenery is minimal, with amusing speech bubbles, and the dancing, choreographed by Arlene Phillips, is cheesy – dancing around small trees and trotting like horses – but eerily reminiscent of some of the quirky routines Pan’s People and Legs and Co gyrated to back in the day on Top of the Pops. The male singers were all excellent, they didn’t try to ‘be’ the singers of the songs, but they held a good tune, and Jackie’s friend Jill (Lori Hayley Fox) and young Jackie had powerful voices. This is a terrific trip back to the happiness and innocence of another time, a great night out, and there is more of a story than I was expecting. The night ended on a terrific high when the cast stayed on stage to sing a string of Seventies hits and had the audience on our feet, singing, clapping and dancing. 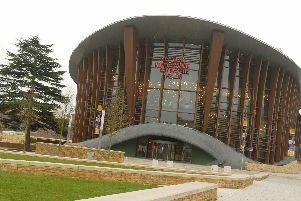 Jackie The Musical is on at The Swan Theatre in High Wycombe at 7.30p each evening until Saturday May 14, with additional matinees at 2.30pm on Thursday and Saturday.